"One must be very careful who this is prepared for. Like a magic love potion, it brings out the lover in ANYone. Through trial and error, I learned very quickly not to prepare this for a mere 'casual date' UNLESS you want that 'casual date' to become 'more'...."
In a medium saucepan, mix together Burgundy wine, canola oil, soy sauce, oyster sauce, garlic and oregano. Bring to a boil, and then remove from heat. Place in the refrigerator 1 hour, or until chilled. 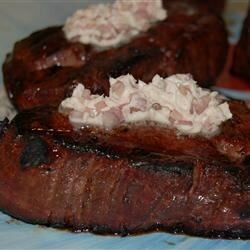 Place filet mignon filets in a 9x13 inch baking dish, and pour the chilled marinade over them. Cover tightly with foil, and refrigerate for a minimum of 5 hours. In a medium bowl, cream butter and 1 teaspoon of Burgundy wine with a hand mixer. Mix in shallots, green onions and white pepper by hand; cover tightly, and refrigerate. Preheat an outdoor grill for high heat, and lightly oil grate. Preheat oven to 200 degrees F (95 degrees C). Grill marinated filets to desired doneness, turning once. Place filets in a clean 9x13 inch baking dish. Dollop with the Burgundy butter mixture, and place in the preheated oven for a minute, or until butter is melted.